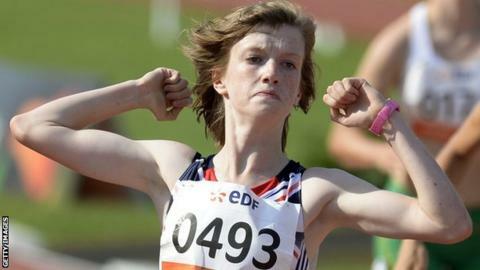 Teenage sprinter Sophie Hahn reclaimed her T38 100m world record in her home town the day after losing it. The 17-year-old's 13.10 seconds was lowered to 13.09 by Russian Margarita Goncharova on Saturday. But the Briton, who has cerebral palsy, responded with 13.04 at the Loughborough International and later tweeted "Could not be happier with the performance I put on the track today." There was also a 100m world record for fellow Briton Maria Lyle, 14. The teenager from East Dunbar clocked 14.83 in the T35 category - smashing the previous standard of 15.63 set by Italy's Oksana Corso at last year's IPC World Championships in Lyon. It is a second world record for Lyle, who also set a 200m best on her international debut in Dubai in February. In Switzerland, double Paralympic champion Hannah Cockroft improved her own T34 100m world record by 0.23 seconds, finishing in 17.31 seconds while fellow Briton Mel Nicholls bettered her own 400m world best in the same class, although the event is not competed for at major international championships. Also at the Swiss meeting, Marcel Hug got the better of British rival David Weir in four of their five races. Hug was victorious in the 800m, 1500m, 5,000m and 10,000m but Weir got a win in the 400m. The Briton, who was drawn in lane eight, clocked 47.50 to finish 0.12 seconds ahead of his Swiss rival who he will face again in August's IPC European Championships in Swansea. "It's been a long time since I've won a 400m. After Beijing I retired from it because I was so disappointed with the final," said Weir who won silver over the distance in 2008. "It's good to beat the guys who train for the 400m. I'm happy now as I've got a win but not in the distance I thought I'd win. I knew I had to wind it up and knew they'd catch me on the bends, but I knew I had a bit more drive down the home straight."